Most stocks advanced on Friday, with the S&P 500 paring a modest weekly decline, while the NASDAQ Composite posted a near 1% gain last week, finishing at a fresh record high. Investor confidence in the economy was bolstered by generally positive economic data, including a strong pick-up in December retail sales. A rebound in auto sales led the advance, with overall retail sales up 0.6% last month, following a 0.2% November increase. For all of 2016, sales rose 3.3%, exceeding the 2.3% gain the year prior. The week was a turnaround for a number of sectors that have outperformed since Donald Trump’s presidential election victory. Energy shares retreated nearly 2% and financial shares slipped. For the week, the Dow Industrials fell +0.39%, the S&P 500 dipped +0.09%, while the MSCI EAFE (developed international) advanced +0.82%. Consumers and businesses are finally on the same page. According to J.P. Morgan, one of the characteristics of this expansion has been the sentiment disconnect between small businesses and the purchasers of their goods and services. Consumers have been feeling pretty good, consistently rating their personal situations positively and voicing optimism about the economy as a whole, while small business owners have disagreed. This difference has had important implications for wages. Agreeing on wage increases is difficult when each side of the table has a radically different view of the economic situation. 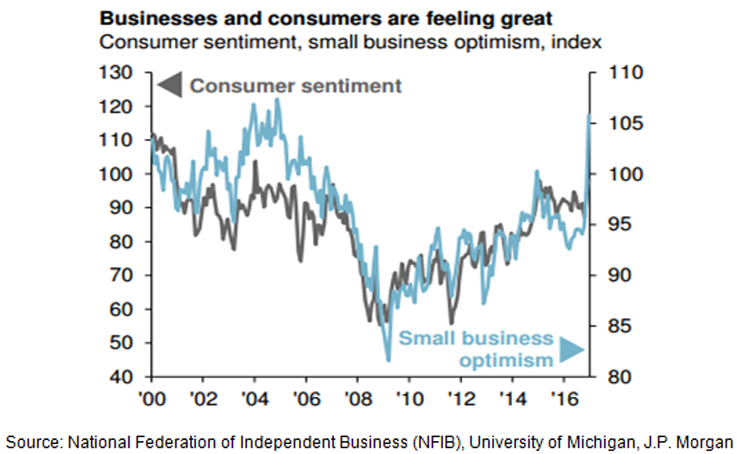 As shown in Chart 1 above, these attitudes have shifted and both small business owners (as measured by the NFIB Small Business Optimism Index) and consumers (as captured in the University of Michigan Consumer Sentiment Index) are now feeling pretty good. In fact, both are feeling the best they have in more than 12 years. Having both workers and their bosses on the same page may lead to long-expected wage increases in the near future. As inflation has already begun to gain steam, such an increase in wages could boost price growth even more and leave the Fed behind the curve in the later part of 2017. For investors, this sentiment shift may serve as a reminder to be aware of the consequences of rising inflation when making investment decisions this year.